Game of Travel vol. 2 – starts now! Oh, wow! I’m so exited! My Game of Travel begins once again today! At 4.45 pm I have the flight to Doha and after two stops I’ll reach final destination – Brisbane, Australia. My next journey will last until May 2016 and I’m going to visit Australia, Indonesia, Singapore, Malaysia, Thailand and later possibly Philippines, Japan and China and who knows, maybe some other countries too (no fixed plans for spring yet). I started this blog in February 2015 during my travels across Central and North America, while I was in Costa Rica. I wanted this site to be my self-motivational tool for painting miniatures. I was thinking – if I go public with my miniatures and my future painting plans, I’ll be more focused and efficient. And, guess what? It’s working:). I paint with scheduled regularity. And right now I take four small plastic boxes full of miniatures, paints and brushes. This is the list of all models I take. I will have work for entire trip. And my blog actually has evolved! At some point I have decided that it would be cool to write something more. Fisrt i started to write reports from the stores I was visiting on the way (so far I’ve been in 2 in Mexico, 2 in Spain, 1 in Czech Republic) and it has happened to be super fun. I want to go on with this – and I think right now I could go full throttle here – there are plenty of hobby stores in Australia, Indonesia, Singapore, Malaysia or Thailand. My plan is to visit as many as possible! Yaaaay! Another thing. When I was in Mexico – I had the pleasure to hang out with the guys from Chiapas Warhammer 40k and Fantasy clubs – we had nice chats and played two battles. This experience was amazing! And it would be awesome that I could repeat that during my next travel. I’ll do research and try to contact some gamers on my way – I’d love to get hobbyists insights form other, distant countries. And starting from the meeting with those Mexican Warhammer players, I’ve realized one thing. I really love to write story-telling battle reports. To develop background story and describe battles from both sides perspective. Add some personal thoughts of heroes fighting in the battle, and push the overall scenario forward – depending if the battle was lost or won. It might be time consuming, but it’s super fun. During my stay in Poland I played several battles of Warhammer Fantasy Battles and one game of Wolsung. And all have battle reports on the blog. They can be found in Battle Reports category (obviously;). During my trip, probably I won’t play as often as in Poland. First of all I will not have my miniature collection with me, so if I would like to play the game of, let’s say Warhammer Fantasy Battle, I need to borrow some minis to play. In Mexico, guys were so nice to allow me to play with their minis. We will see how it’s going to work in Asia. 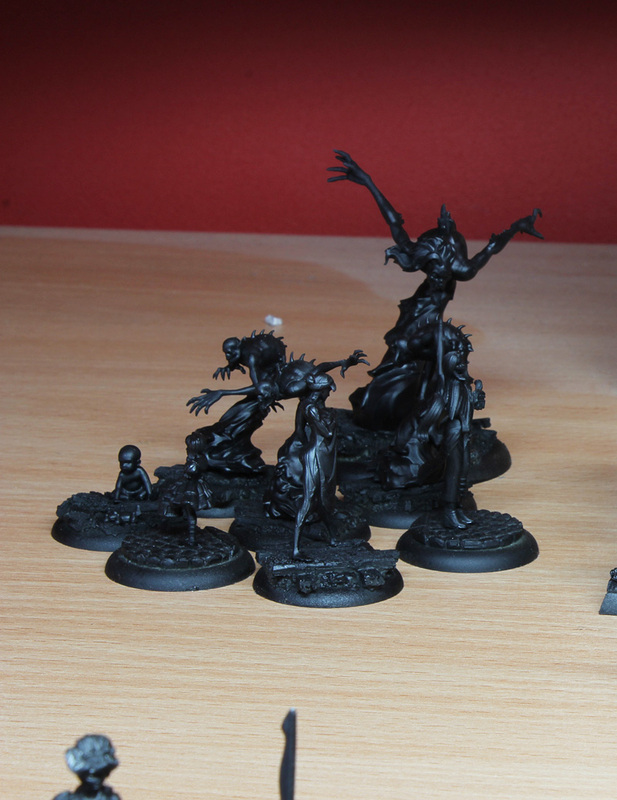 Thankfully, I’m taking Malifaux and Infinity models. Skirmish games like these are just perfect for travelling. You just need around 10 miniatures ans you can play the game – so maybe I’ll find some players willing to play with me a little game of Malifaux or Infinity. Who knows. And I could write more battle reports too! 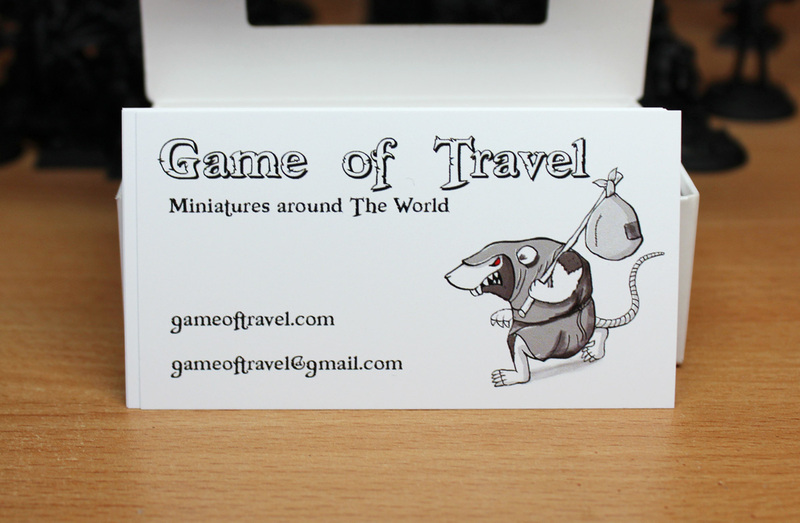 I really like the direction that my blog goes, but to be honest its basic idea is to be travelling blog (the name: Game of Travel has to mean something:). I can get its full potential, I think, only during my journey. Therefore, right now, today, Game of Travel is back on track again. The second Chapter begins – all the miniatures I’m going to paint, all the hobby stores and clubs I’m going to visit, all the people I’m going to meet – these will be unforgettable memories and Game of Travel will be my journal. Public journal and open to everyone – I hope readers of my blog will find my topics interesting and growing group of follower will keep my motivation to write at constant high level. Soon I’m going to replace my profile photo on every social media and logo on my site, and look at this – I already have made these brand new business card. 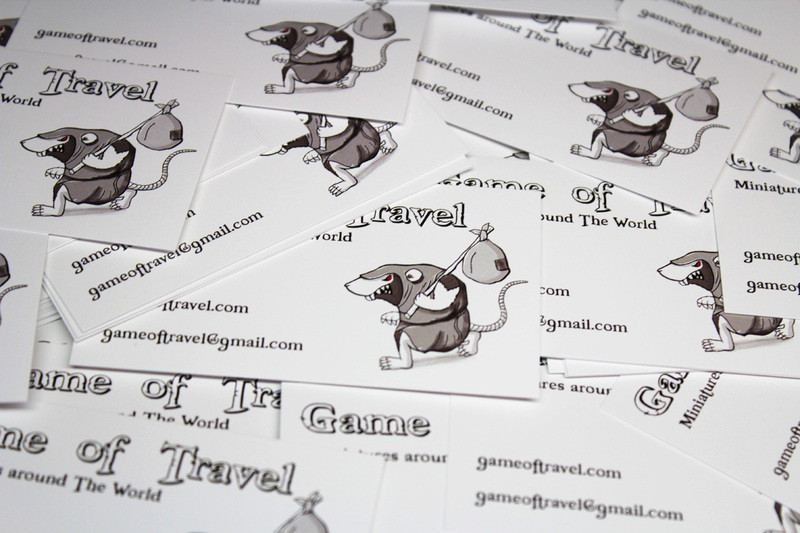 This stuff is getting serious – no retreat – business cards! I feel so excited! Candy or Baby Kade are my first in painting line. 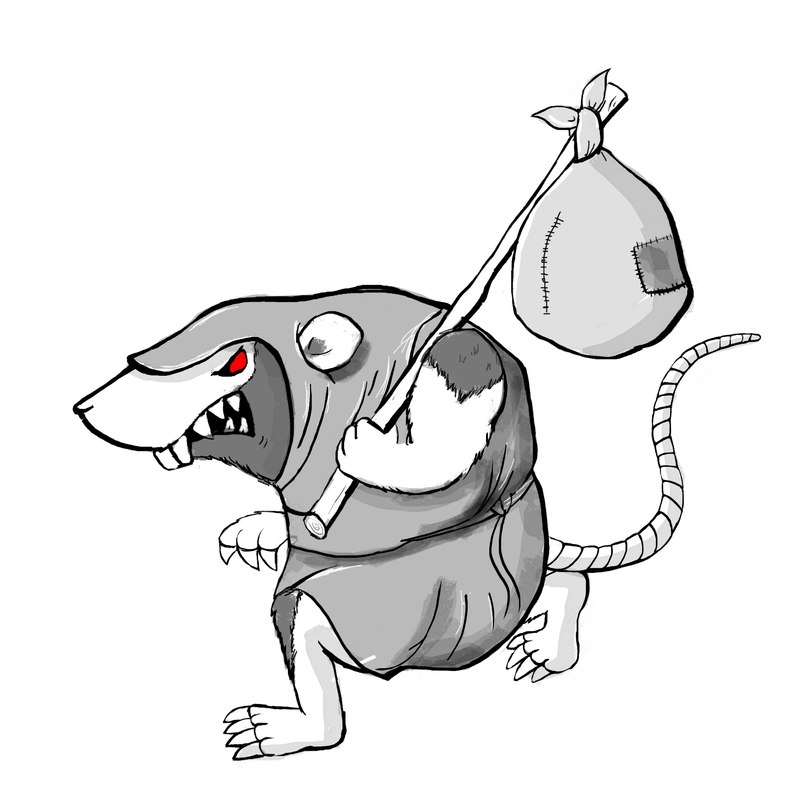 …and still I have some overdue report to write from my Warhammer Fantasy Skaven battle vs Dwarfs. Crazy busy time behind me, so expect it soon. But beside that – everything I plan to do, it will be part time;). Starting from today for next 2-3 weeks I am the tourist! Until next time…next post will be from Australia! Where are you travelling in Australia? and where you from exactly? hahaha! I really wanted to go to Melbourne but we needed to choose only few places and my wife really wanted to see Kangaroo Island. well, she’s the boss, you know…;) next time!